Wise words from a wise man. Spoken eloquently by a legend. Not just any legend, they call him Larry Legend. Some call him The Hick from French Lick. Some call him The Great White Hope. I call him a hero. A trailblazer of the small forward position. The epitome of versatility. One of the greatest sharpshooters the game has ever seen. A champion. To you casual basketball fans, you might know him as Larry Bird. Succeeding with one's God-given talent would be an understatement in the case of Larry Legend. Taking a second-rate Indiana State University(in terms of NCAA Men's Basketball relevance) to an undefeated season and its first NCAA tournament appearance all the way to the NCAA National Championship game in 1979. Only falling short to Magic Johnson's Michigan State Spartans. Eerily foreshadowing of what would be to come of the two players. Winning the Naismith College Player of the Year award with a small school was a feat in itself. And there was no question he deserved it. As well as the heralded John R. Wooden Award. Such a successful college career is even more remarkable when you consider the loss of his father at the tender age of 18. Exemplary of how the legend wouldn't allow anything to keep him off balance and thwart him from achieving his goals. After a brief fall from grace, the illustrious Boston Celtics would draft Larry Legend and soar right back to the top of the NBA. Bird burst onto the scene with an incredible Rookie of the Year campaign. 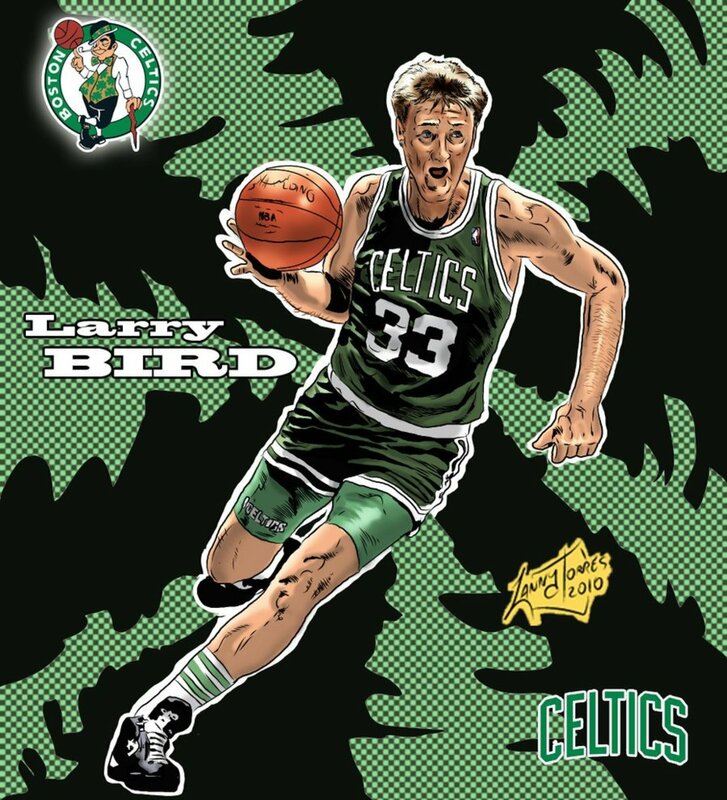 There was simply no denying Bird's instant impact on the Celtics. The Celtics went from a 29-53 below average team to one of the best team's in the NBA. Averaging 21.3 points per game, 10.4 rebounds per game, 4.5 assists per game, 1.7 steals per game, and .474/.406/.836(FG/3P/FT) ratios. The Celtics would then go on to the Eastern Conference Finals only to fall to the rival, Philadelphia 76ers 4-1. After a key trade for Robert Parish and drafting Kevin McHale, Bird's Celtics retooled to seek revenge on the 76ers. Revenge that they would achieve in a thrilling 7-game series in the Eastern Conference Finals in 1981. It wouldn't come easy. Turning the tables from the previous season, the Celtics would come from behind 3-1 to defeat the 76ers to become the 2nd team in NBA history to come from behind a 3-1 obstacle. The previous team being the 1968 Boston Celtics. Ironically, they also did it against the Philadelphia 76ers in the same setting, the Eastern Conference Finals. And just like the 68 Celtics, the 81 Celtics would go on to win the championship, beating the Houston Rockets 4-2. The Finals MVP would go to Cedric Maxwell who was seen as having the most "steady" series. But it was Bird who was the straw that stirred the drink. Bird averaged 15/15/7(Points/Rebounds/Assists) in the Finals on .419 shooting. Not bad at all for a second year player to say the least. Already a championship, two All-Star appearances, two All-NBA First Teams, and nearly a Finals MVP. Bird's remarkable march towards legendary status was just beginning. After failing to win a championship with 63 and 56 win teams, the peak of Larry Bird's career would be reached. It would be the beginning of a legendary rivalry and the rekindling of old college basketball foes. It would be the beginning of a three-year MVP reign. The Bird vs. Magic rivalry was born, and NBA ratings would soar to new heights, making it one of the most popular sports in the world. 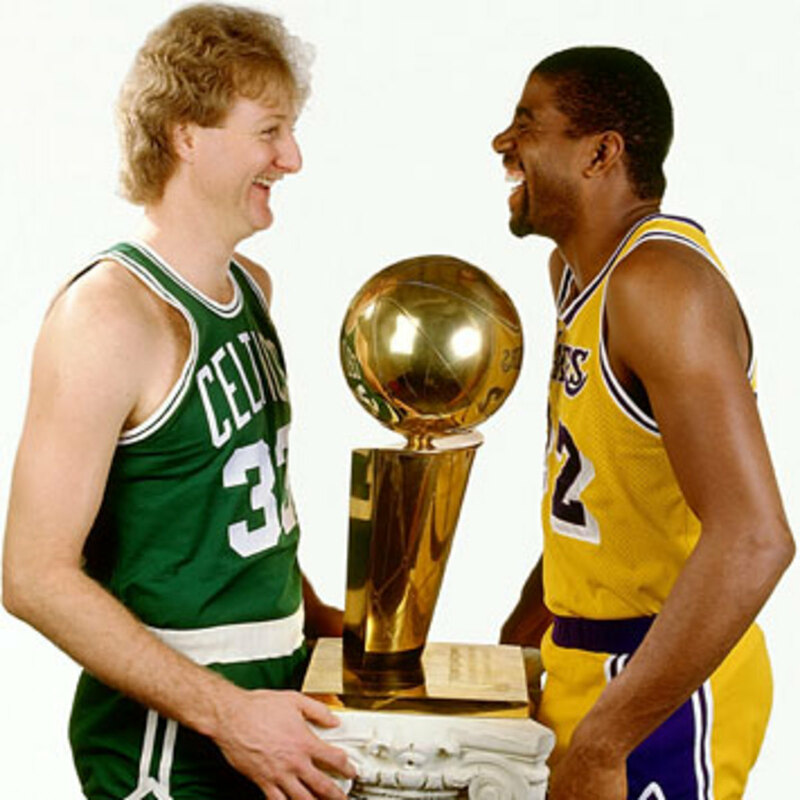 Bird would get the best of Magic in the 1984 Finals, but ultimately, Magic got the better of the two by winning two of the three meetings between each other in the Finals. Through it all, Magic ended up winning more championships and Finals MVPs. Magic won five championships, three MVPs, and three Finals MVPs. Bird won three championships, three MVPs, and two Finals MVPs. Even more remarkable when you consider that Bird wasn't always as fortunate as Magic. Bird's career is scattered with legendary teammates at the end of their careers. One year each with Hall of Famers Dave Cowens and Pete Maravich. Only two seasons with Bill Walton, and four seasons with Tiny Archibald. Oh what could have been with the elite prospect, Len Bias. Bird had great teammates. You don't win titles without great supporting casts in this league, but Bird didn't have it as easy as Magic Johnson. Magic joined forces with a team who was already a playoff contender and had an all-time great center in Kareem Abdul-Jabbar. They constantly put the right players around him to complement his style. Whereas Bird had to make things work with guys that didn't really complement his style as well. The Lakers hardly ever had to face opponents like the 76ers or Pistons in the Western Conference Finals. They won the West eight times in the 80s. When you consider Bird's Celtics had to routinely go through the Philadelphia 76ers and those same Lakers just to win three championships, it's not hard to see just how tough Bird had it. You could make a case that the Celtics should have never won a championship with those rosters given the brutal competition they had to overcome. The Lakers won five championships in the 80s. The 76ers made it to three Finals and won one championship. Later, the Pistons would join the party and provide even more resistance to Larry's Celtics. Bird and Magic's accumulative stats per game head-to-head in the Finals. They faced each other in the 1984, 1985, and 1987 NBA Finals. In the twilight of Bird's career, his teams just couldn't compete with some of the best teams in the league like the Showtime Lakers and the emerging Detroit Pistons. Bird would have his best statistical season in 1988 and fall just short in the Eastern Conference Finals to the Detroit Pistons. In that season, he averaged 29.9 points per game, 9.3 rebounds per game, and 6.1 assists per game while joining the exclusive 50/40/90 club by shooting .527 from the field, .414 from three point land, and .916 from the free-throw line. A truly remarkable season. An aging cast and limited depth kept Bird from facing Magic a 4th time in the NBA Finals and possibly winning his elusive 4th ring. The tale-end of Bird's career would be derailed by back injuries which led to his retirement. There is no denying Bird's impact. That little town in Indiana would produce one of the greatest players the game has ever seen. Had it not been for the Showtime Lakers. Had it not been for the Philadelphia 76ers. Had it not been for the Detroit Pistons. Had he had a more stable roster. Had he played with Hall of Famers like Pete Maravich, Dave Cowens, Bill Walton, and Tiny Archibald in their primes. Had Len Bias not tragically died. Had it not been for his bad back. What if Bird just had half of the athleticism that Michael Jordan possessed? Just what if he played with someone as great as Kareem Abdul-Jabbar? We can only imagine how many championships Bird could have won. Year after year it is asked who will be the next Michael Jordan. I have a question. Who is the next Larry Bird? Who would you rather take the last second shot? Larry Bird was every bit as great of a player as MJ. Where MJ excelled at athleticism, defense, and scoring; Bird excelled in basketball IQ, passing, shooting, and rebounding. Who knows who's the more clutch player. We'll just call that a draw. While Jordan is the superior defender of the two, Bird made many clutch defensive plays in big moments. On an all-time list, Michael Jordan is certainly higher than Bird, because his resume just speaks for itself. 10 scoring titles. Five MVPs. Six Finals MVPs. A Defensive player of the Year award. Sheesh. With that said, there is no denying MJ had it easier than Bird did. Jordan's most memorable moments came against the likes of Karl Malone, John Stockton, Patrick Ewing, and Charles Barkley. All who would never have the luxury of winning a championship, due to his Airness of course. All Hall of Fame players, but do they really stack up against the Hall of Fame talent that Bird squared off against? Replace those players with Magic Johnson, Julius Irving, Kareem Abdul-Jabbar, and Moses Malone. In case you were wondering, that is 13 combined championships, 13 combined MVPs, and six combined Finals MVPs. That's what Larry Legend had to go through. That's not mentioning anyone from the Bad Boys Pistons or a prime Dominique Wilkins. Jordan never had to go through the Showtime Lakers. When he faced the Lakers in the Finals, they were older, just lost Pat Riley, and Kareem had retired. Still a great Laker team, but nothing comparable to the Showtime Lakers. MJ had a tough time getting past the Bad Boys Pistons and didn't get past them until they pretty much fizzled out. Due in large part to his father's death, MJ would retire briefly and never face those great Houston Rocket teams led by Hakeem Olajuwon. Those Houston teams had the best shot of any team in the 90s of knocking off Jordan's Bulls and putting a loss on Jordan's Finals resume. The Bulls had no answer for Hakeem or the Rockets' three-point shooting. The Rockets also sported a suffocating defense anchored by Hakeem. We were all cheated out of a possible great Finals match up in 94 and 95. The 95 team unbelievably won the championship as a six seed. Never having homecourt advantage. They won at least two road games in every series. Winning Game 5 in Utah in a Best-of-5. Winning Game 7 in Phoenix after trailing the series 3-1. Winning three road games against the San Antonio Spurs in the Western Conference Finals. Completely sweeping the Orlando Magic in the NBA Finals. Yet it is widely considered that Houston wouldn't have won any championships had MJ never retired. Could a team with the mental fortitude to win as many road games as the Rockets did in 95 not give Jordan's Bulls a run for their money? Yet we all are left wondering what could have been, and there are no blemishes on Jordan's sparking Finals record. Yet Bird has multiple blemishes in large part due to his level of competition. A collection of quotes attributed to NBA basketball player and coach Larry Bird. When it is asked who will be the next Michael Jordan, I feel as if it's some sort of disrespect to Larry Bird. I don't feel like Bird properly gets the credit he deserves. You don't hear "who will be the next Larry Bird" as often as you hear "who will be the next MJ." I feel like Bird only gets respect because it's just assumed that he was great. The fact of the matter is, Larry was greater than great. In order to win championships, he had to beat all-time great teams. 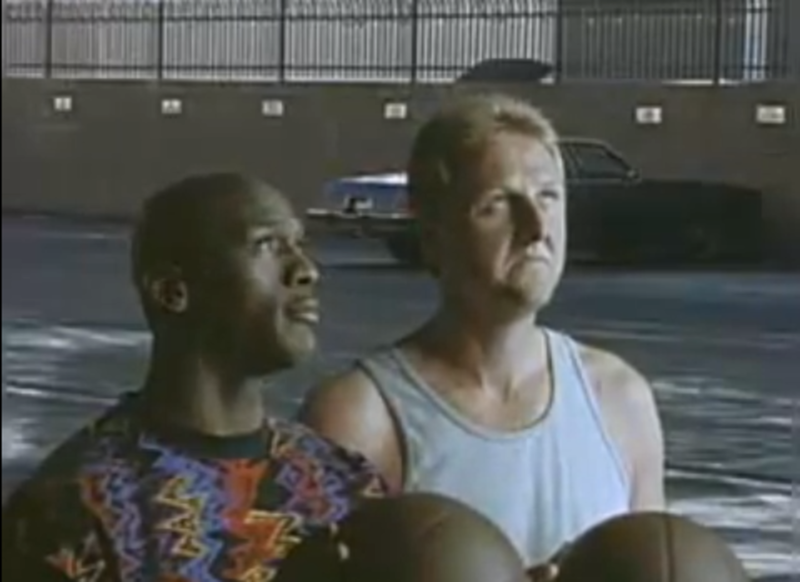 Of course Larry Bird wasn't as great of a scorer as Michael Jordan. He wasn't as charismatic or as great a passer as Magic Johnson. He didn't possess as great of a back-to-the-basket game as Kareem Abdul-Jabbar. He wasn't as great of a leader as Bill Russell. He wasn't as physically dominating and athletic as Wilt Chamberlain. But he was every bit as great as all of them. The epitome of clutch. Uncommon versatility. Enviable shooting ability. An inspirational leader. The great white hope. A legend. A rare bird. Really interesting poll question. Michael Jordan is definitely the best I've ever seen, but I would have to go with Bird for a last second shot. I've seen it. It's an interesting piece. Yep, Larry wasn't the most athletic, but he made up for it with his IQ. I'm so glad there is plenty of video of Larry battling. Wish I could say the same for Bill Russell and Wilt. One of my all time favorites, wasn't overly athletic, fast and could not jump out of the gym, but Larry Legend was a beast and one of the best.